“And why is it that we have won only two silver medals from all the Olympics that we have participated in, thaaththa?” Bindu wondered. “That is because they don’t have the sports that we excel in at the Olympics, Bindu,” Percy suggested. “Well, there are quite a few sports at which we could have won gold medals, if only they were staged at the Olympics,” Percy declared. “And what sports are these, thaaththa?” Bindu was curious. “Why, if they gave gold medals for holding the most number of elections, surely we will win a gold medal,” Percy pointed out. “Then, of course the Greens will take the gold medal for losing the most number of elections without ever winning one,” Percy observed. “And the Leader of the Greens must also be awarded a separate gold medal for being the longest serving Leader of the Opposition,” Bindu said. “If that is so, his deputy must also get a gold medal for launching the most number of unsuccessful attempts to overthrow a Leader of the Opposition,” Percy argued. 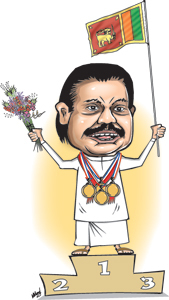 “And of course, our two education ministers will certainly share the gold medal for conducting exams with the most number of blunders,” Bindu declared. “And why is that, thaaththa?” Bindu asked. “Why, they must get a gold medal for being the Police force that has the most number of wanted suspects who remain at large because they are never caught even though everyone knows where they are,” Percy said. “And we will surely win a gold medal for producing the minister who engaged in the most number of incidents of intimidation, without ever getting punished for them,” Percy observed. “And how could we forget his colleague who will win a gold medal for throwing the most number of stones at a judge?” Percy asked. “And we might also win the gold medal for breeding the highest number of dengue mosquitoes,” Bindu recalled. “And we may also win a gold medal for buying the most amounts of contaminated petrol and diesel,” Percy remembered. “And if we are lucky, we might also win a gold medal for the most number of times a country has introduced power cuts,” Bindu said. “And our country should also win a gold medal as the country which had the most number of other countries interfering in its internal affairs and offering solutions to its problems,” Percy suggested. “Why is that, Bindu?” Percy inquired. “I think he might be in line for another gold medal.” Bindu observed. “And what medal would that be?” Percy wondered. “Why, thaaththa, he might win a gold medal for the most number of times someone cancelled a scheduled speech in England ,”Bindu pointed out. “Which one is that, thaaththa?” Bindu wanted to know. “Why, he can’t win the gold medal offered for being able to turn a man into a woman, which they say is the only thing he cannot do now,” Percy pointed out. “I think he has already won that gold medal too, thaaththa,” Bindu said. “How could that be?” Percy was surprised. “Why else would SB keep on referring to him as ‘Janadhipathithumiyani’, then?” Bindu asked. Percy didn’t quite know what to say to that.